I was surprised to find that so many people were willing to share with me what makes them smell so good. I had a list of dozens of perfumes. Armed with nothing but my will, some cash, and ironclad nostrils, I set out on a journey to find my next signature fragrance. The following is my experience. You can read all about my Day 1 experience here. It was brought to my attention that I needed to try the world’s more natural and pure fragrance offerings: essential oils. I thought, hey, why not now? Being not-so-natural, I had no idea where to purchase these things, and although every drug and grocery store website said they keep them on the shelves, I was not about to schlub around town unearthing them. Also, I didn’t feel like leaving the house that day. So I went out on a limb and ordered myself some essential oils online. When the little brown glass bottles arrived, I was all, hey, I’ve so done this before, way back when I had babies and I fell for the CHEMICALS KILL BABIES messages that every mom hears when she has babies and I got rid of chemicals and cleaned our house and clothing with baking soda, vinegar, tea tree oil, and prayers. Then one day I realized that our house never smelled clean, but like farts. So I went back to chemicals. Because chemicals smell clean. I had five essential oils at my disposal: lemon, tangerine, fresh air (a citrus blend), lavender, and ylang ylang. The citrus ones smelled very much how you think they'd smell, the lavender smelled like heaven itself, and the ylang ylang smelled strong and a little powdery, and it'll either take some getting used to or blending to make me love it, but I guess I deserve the extra work because I bought it blind but mostly I bought it for the name because it's funny. Ylang ylang. If anyone’s going to die from essential oil poisoning it will be me, so I followed the dilution instructions exactly. There were warnings on every insert in the package and on every bottle to avoid applying pure oils to skin, and dilute it instead to a 2% concentration or some such mathematical garbage. I even Googled it to double check and Google said the same thing, so I heeded all the warnings. I have experience with natural plant oils touching my skin, and the result is always hellish (hello, poison ivy rash every time I go outside). If I slather myself with straight oil it will go straight to my brain and I will die, and people will read about me on Weird News Daily and I will receive a Darwin Award for dying while trying to smell like an orange as much as possible and I do not want my children to have to navigate that legacy. I applied a combination of tangerine, lemon, and fresh air essential oils all over, saving the lavender for another day when I can smell like laaaaavenderrrrrrrrr and only lavender the whole livelong day. It will be glorious, I tell you. I dabbed these scents everywhere: on my wrists, insides of my elbows and forearms, backs of my knees, my ankles, the front and back of my neck, around my hairline, my collarbone, and behind each ear. I even went the extra mile and brushed it through my hair and right before I got dressed, I slapped it, aftershave style, under both armpits. I smelled delicious, like a citrus grove. I wanted to eat my hands. I had shopping to do, errands to run, and a lunch date, so I hopped in the car to the mall, my first stop. I figured that was as good a place as any to try my new fragrance, and planned to stand as close as I could to strangers and wait for the compliments to roll in. I forgot how hard it is to get close to people at a place that is mostly deserted. Plus it was two o’clock in the afternoon on a Tuesday, the wrong time in general for mall shopping. That didn’t stop my mission, so I honed in on the few customers I saw, strolling over to each one as closely as was comfortable. Not one of them remarked on my fresh, citrus fragrance, but I soldiered on, finding a steal on bath towels that boosted my lagging spirit. I leaned into the salesclerk as she rang up my purchases, but I figured she was too busy telling me how much money I saved to notice that I smelled like Florida. Walmart was my next stop. As I made my way to the air mattress department, I stayed as close to customers as I could without seeming mentally deranged until I remembered where I was shopping and decided that if I was going to seem odd, this was the place to do it. I saw a Harrison Ford lookalike, complete with crew cut and earring. I thought about sidling up next to him, until I got a load of his lady. She looked like she might punch me in my orange-scented throat if I got too close to her man, so I wisely left Han Solo to fight his own rebellion. Clutching my items, I stood in the checkout line, wondering if essential oils present a gradual fragrance release. I decided to research it when I got home. As I contemplated my future as a master perfumier, I considered that maybe I have a vitamin C deficiency and my skin ate it. My body is so thirsty for this nutrient that it is casting desperate nets to capture it. I thought about exiting the line to pick up a bag of oranges to supplement my diet, but then immediately caught something wonderful in my nose. This was it – my time in the sun. I moved closer to the couple in front of me, giving them no room to miss my fragrance. 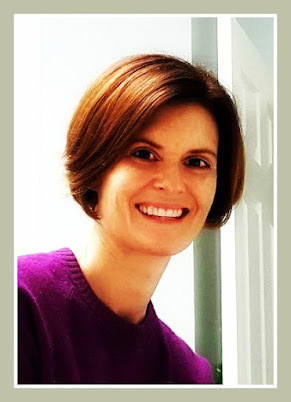 The woman inched forward and I realized that it wasn’t the clean, fresh scent of my own lemon-infused hair that wafted back to me, but her own shower-fresh scent. I wondered what kind of shampoo she uses. She didn’t. Not even nose to skin, she didn’t. Essential oils: 1, Andrea: 0. Defeat stinks. Stupid nature. Everything about me rejects it. Scent Search Day 2 ended. I concluded that the good thing about essential oils is that there are a lot of uses for them, so I don't feel as if I wasted any money. I'll definitely keep them around - our laundry never smelled so lemony fresh. And the lavender, of course - a few drops in the bath and I'm Elizabeth Taylor again. I can't believe I never thought about having it around, just for me. Every girl needs a little lavender in her life. Ylang ylang EO - use sparingly, in combination with another fragrance, or to terrorize teenage son, who rudely announced that it “stinks, and smells like diapers"
Shopping note: I ordered all the essential oils listed from Fabulous Frannie, an online oil seller. They also sell other natural products like lip balm and soap and salt and wax. I don't know. All I know is the stuff was cheap, it came fast, and I would buy from them again. They did not pay me to mention them in this post. I just did. Because I'm cool like that. Lavender is my favorite. I will keep my eye out for a viral youtube video of you trying to get too close to random people at stores. Thank you so much! I would like to see it for myself. I'm sure it's not as awkward as it sounds. Surely nothing can be that awkward. I have armfuls and armfuls of lavender fur you. Just come and get it. Oh, I wish! I have one little puny plant... that I strip mercilessly just to get the leaves so they can fill my life with fragrance. Vitamin C deficiency and your skin ate it - FUNNIEST THING I'VE READ THIS WEEK! Thank you - clearly I'm unsure on how biology works. 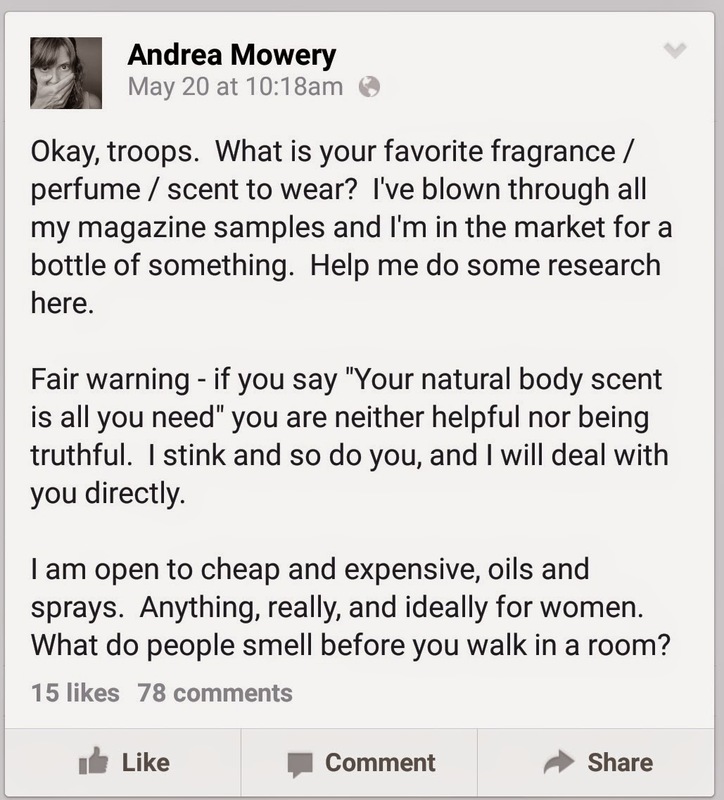 I can't wear perfume as I am allergic to it. Some are worse than others, such as Satsuma by body shop - as my throat closes up if go anywhere near it. I do have a roll on fragrance oil that is Tahitian Vanilla that is downright heavenly! 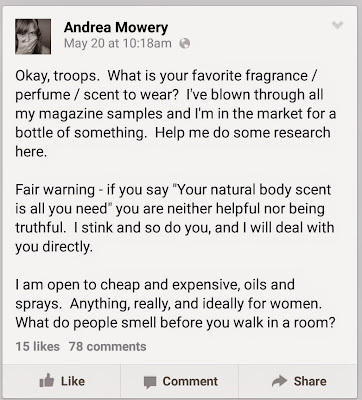 Perfume is a huge allergy trigger for so many people! But I'm glad you found something you love. Tahitian Vanilla sounds like a exotic cookie. Delicious.